Recommending books to others is hard, because my preferences will not necessarily be yours. But this one really speaks to me and I believe has a universal value for anyone with any artistic leanings. By artistic, I mean anything creative, from painting to writing, baking to blogging, basket weaving to programming, you name it, whatever rings your bell.The book is a self-help tome – not my preferred reading genre – but this one has really kick-started me. 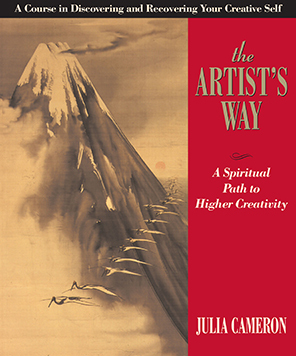 This website and several other creative projects I have started recently emanate from reading this book. The premise is stated on the cover ”a twelve week course that guides you through the process of recovering your creative self. It dispels the ‘I’m not talented enough’ conditioning that holds many people back,” All those negative people in your life that have demeaned you get taken to task with this book. The book is packed with great quotes and exercises to help you recover your creative self. Two wonderfully powerful ideas come across to me. The first is her Morning Pages, three pages every morning of a stream of consciousness, written uncensored, as if no-one will ever read them .It is a powerful way of clearing all that dross in your mind before the day starts and getting it all down on paper – ideas, moans, whatever comes to mind . As Julia states ”Although occasionally colourful, the morning pages are often negative, frequently fragmented, often self-pitying, repetitive, stilted or babyish, angry or bland – even silly-sounding. Good!” I have been doing them for 5 months and don’t know how I did without them. The book states handwritten pages but my writing is so awful in these keyboard- driven days that I do mine password-protected on the laptop. There are also apps and sites that translate 3 pages as 750 words through the keyboard. I haven’t used these so can’t recommend any specifics here. This is the second big idea that I find so rewarding, taking yourself alone, weekly, on a new experience. The idea is to free your inner child and fill that well of yours with creative ideas. So far, some of mine have included a trip to an Antiques Emporium, a museum, an art gallery, an hour in a pound store, Handel’s Messiah at a cathedral, a trip round a pottery factory, purchase of some creative off-the-wall magazines. All have been done in solitary and have been fun and rewarding, they are things I would not normally do and have in the main cost nothing or very little.